Some wait all year for it and then devour it page by page. Vogue's 120th anniversary issue is longer than most novels, the September issue of Vogue is 916 pages and a good 90% are ads for stunningly beautiful things like Ralph Lauren and Prada, and Lanvin and the ads go on and on. . . 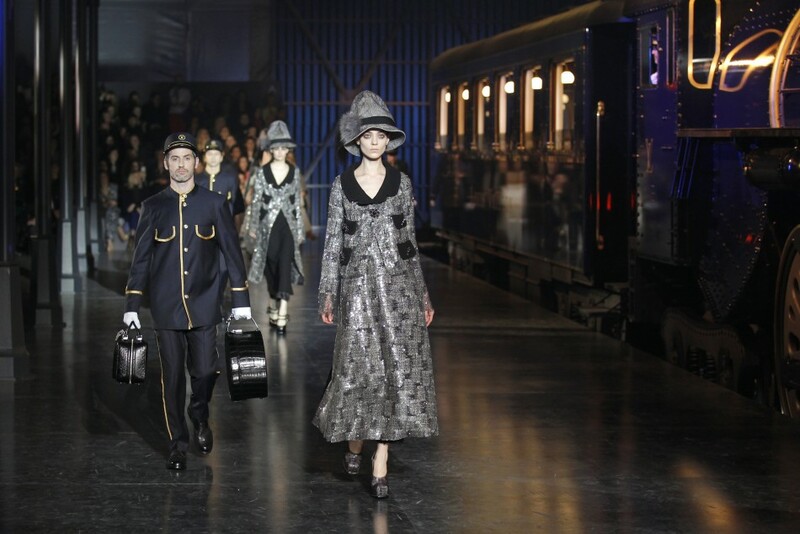 So what if most of us will never own that opulent Marc Jacobs Louis Vuitton dress as seen on a model photographed on a vintage locomotive as it rolls into the station circa 1912. So what we, love looking at them. Read more about this 8 million dollar steam engine here. 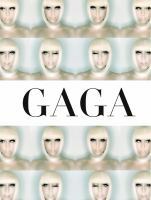 All photographed by Steven Meisel. 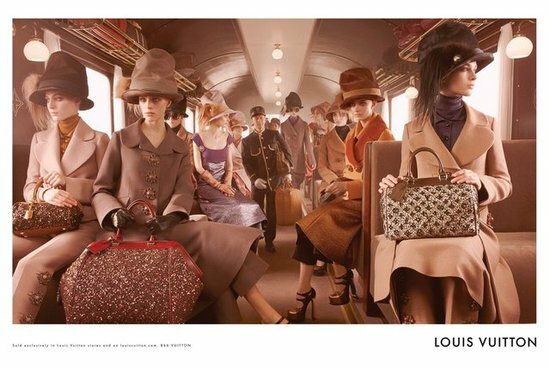 Click to watch the Vuitton Fall 2012 Runway show. The September issue has always been the one that all Vogue readers have waited for, as it is the issue that signals the turn of the season from summer to beautiful autumn and brings to us the best of the runway collections. 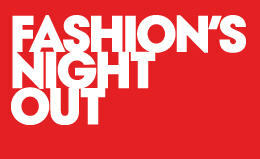 This issue also gets the fashion world ready for Fashion’s Night Out, which behind on September 6, 2012. 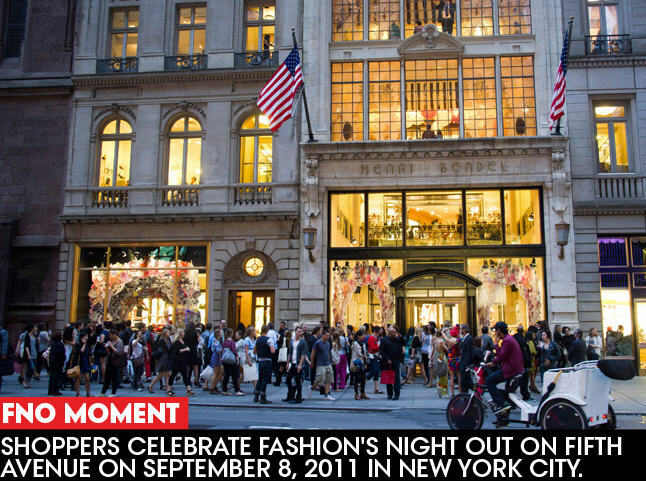 It is the night that brings the editors, stars, models, and designers together as they visit the stores across the country and around the world for fashion's most iconic extravaganza. This issue at its 916 pages is full of the most sumptuous collections seen in a very long time. There is the opulence, the brocades, the beautiful cuts of the suits, and gowns so full from Vera Wang and Dior that the woman who dons such a dress will have to pose in a cornfield. We also see Victoriana and bustles photographed at Edith Wharton's estate, The Mount, in Lenox, Massachusetts. 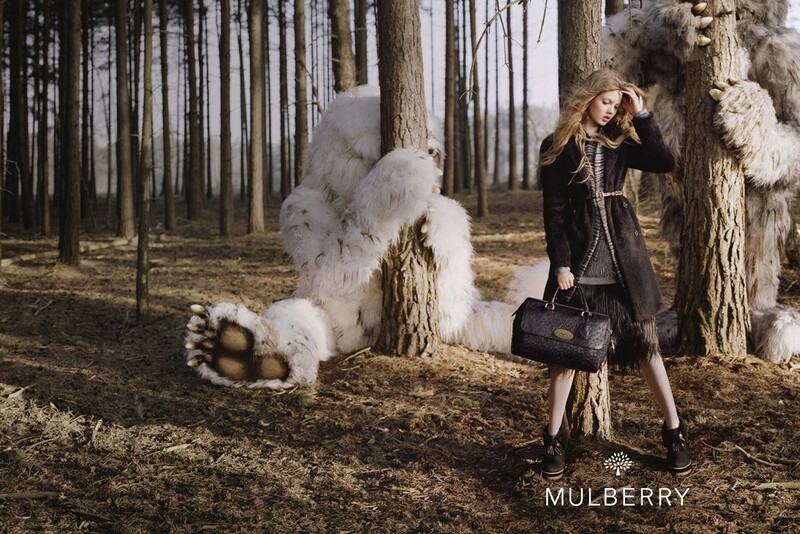 There are delightful Mulberry ads with model Lindsey Wixson all influenced by Maurice Sendak's, Where the Wild things Are. Shot by Tim Walker in England's Blackheath Forest (a place whose very name can't help but conjure fairy-tale visions), the images feature the model surrounded by a host of larger-than-life monsters and beasts. 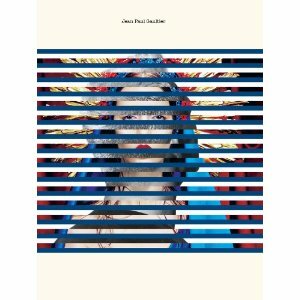 If you are a Florence and the Machine fan, you can catch an ethereal photo of Florence Welch, on pages on 854-855. Riding a black horse and swathed in Chanel and Dior she brings theatricality to her photo spread as she does to the stage. As always there are the special foldouts that feature designers specifically Dior who congratulates Vogue in their 120th year of publication. 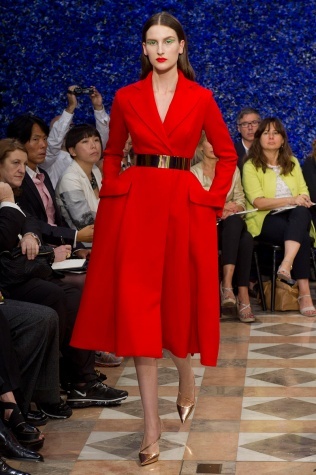 One fold out features a spectacular red Dior dress which show the inside construction and reminds us why so many pay so much for couture. 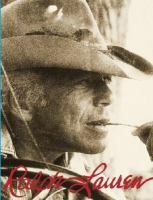 This issue as always in the last few does not have a model on the cover but instead a celebrity. 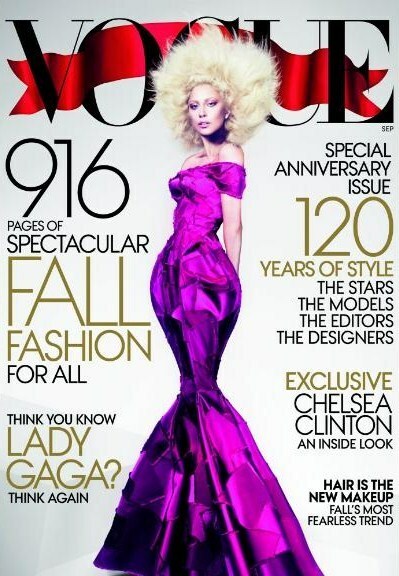 Lady Gaga is poised in vibrant Marc Jacobs fishtail gown for her return engagement as cover "model." 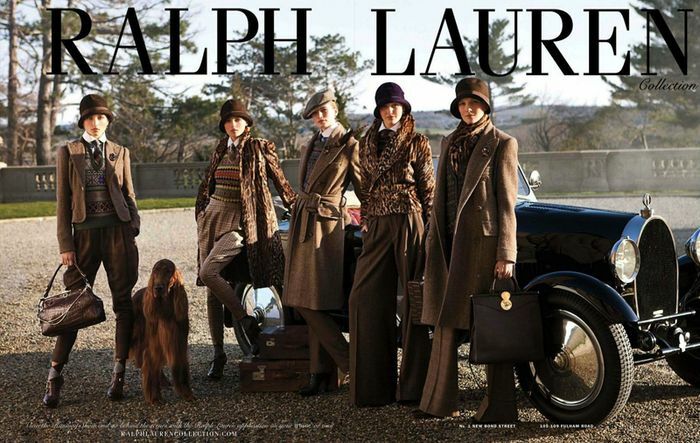 It would be nice to see models on the covers again, as they are the ones who really sell the designer's goods. Watch the Vogue shoot here. The whole issue is a fantasy one that most will never see but it is always interesting to see what the designers are up to. 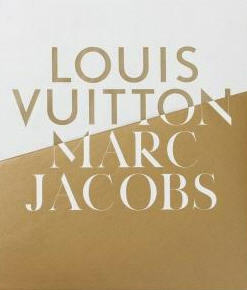 You can check out many items from the library collections about designers, models, and fashion. See some of them below from Central's vast collection.